Shown above: 2 Box Concrete Sectional Corner Chairs, 3 Box Concrete Center Chairs, 1 Waterfall Concrete Coffee Table (other items shown are not included). 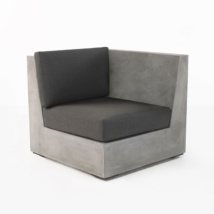 We have taken outdoor concrete furniture to the next level with the masterful Box seating collection. 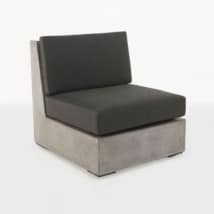 Not only does it have the wow factor, it is designed to function in your space whether large or small. 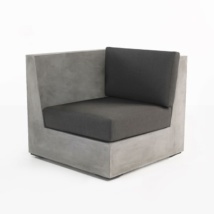 The Box collection is made up of 4 different pieces; the center, corner, left and right end chair. 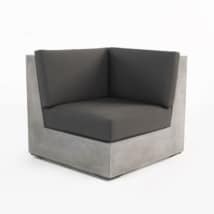 Each piece is sculptured into a sleek and modern deep seat and topped with inviting Sunbrella cushions. The dreamy design is indeed modern, but also has a zen vibe that will help you create your own personal outdoor sanctuary. If you have questions about the Box collection and how it can fit into your space, please don’t hesitate to call or email us today. We can help you design the configuration that will work in your indoor or outdoor space.